Foreign Minister Sameh Shoukry…. we are approaching the end of 2015 and all the external challenges it held for Egypt … regionally and internationally…. 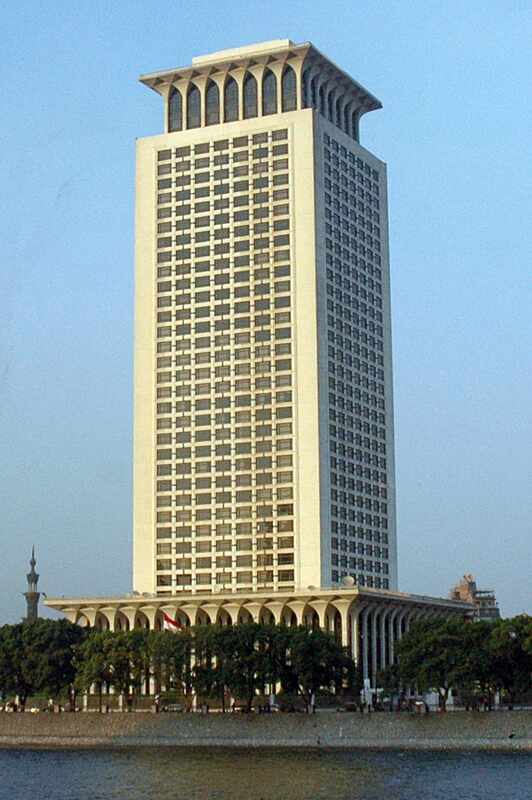 Overall, are you satisfied with the performance of Egyptian foreign policy during 2015? In general, I can say that there is satisfaction with Egypt’s ability to meet the many foreign policy challenges it faced over the past year. The challenges were formidable and multi-dimensional, and many of them were directly linked to Egypt’s national security. There is no doubt that facing these challenges required the confrontation of a number of internal challenges as an initial step, given that foreign policy and its ability to achieve its objectives is directly related to the internal situation of the county. In my assessment, internal achievements – in terms of the fight against terrorism, the start of the implementation of major economic and investment projects, and the successful completion of the internal constitutional framework and the political roadmap with its different stages – have greatly contributed towards strengthening Egypt’s ability to confront external challenges and achieve its foreign policy goals over the past year. This has certainly required considerable diplomatic effort to inform the international community of the reality of the situation in Egypt and the size of the challenges confronting the Egyptian state. Diplomatic efforts were necessary to explain each stage of the political roadmap and to mobilize international support for Egypt, both bilaterally and within the framework of various international organizations. In your view, what are the most important challenges Egypt faced externally in 2015? The biggest challenge has been the extent of Egypt’s ability to navigate the storm the Middle East is passing through and to maintain internal cohesion and stability. Amidst this storm, proceeding at a steady pace on the path to economic and social development, while simultaneously enhancing Egypt’s political, economic and security infrastructure was the main challenge. Numerous factors contributed to instability in the region in 2015. These included turmoil in Egypt’s direct geographical vicinity, such as in Libya, Gaza (particularly control of the border with Gaza and its impact on stability in the Sinai), the political crisis in South Sudan, the continued instability in the Horn of Africa and Somalia, the escalation of terrorism in Africa’s Sahel region, and challenges to the security of the Red Sea. If we add to this the security and existential challenges facing the Middle East, whether in Syria, Yemen or Iraq, we will find ourselves facing immense challenges that Egypt was able to confront. This allowed us to maintain cohesion, steadfastness, and stability while continuing to effectively contribute to addressing these crises by offering practical and realistic solutions. From the perspective of Minister Sameh Shoukry…. What were the most important Egyptian diplomatic achievements over the past year? The word “achievements” is not the most accurate terms to evaluate the performance of Egypt’s foreign policy over a year. Perhaps it is more suitable to say “reviewing what has been achieved towards the realization of national goals.” This allows for a more accurate and objective assessment of the extent to which Egypt was able to achieve its foreign policy goals over the past year. To begin with, I would like to point out that President Sisi’s “Summit Diplomacy” and his numerous visits throughout the past year have paid off. The diversity of these visits, and the President’s direct communication with other world leaders, show Egypt’s desire to open up to the world. Along with my visits to Africa, Europe, Asia, the United States and South America, these Presidential visits clearly indicate that Egypt has been able to set the foundations for solid and diversified foreign relations in 2015. Through such efforts, Egypt was able to build bridges for strategic relations with a number of countries, such as Russia and China, in addition to enhancing bilateral relations with Ethiopia (which have witnessed a significant transformation since President Sisi made a historic visit to the country), as well as relations with the Sudan. Moreover, in the context of Egyptian-US relations, 2015 witnessed the resumption of the strategic dialogue between the two countries. This is not to mention relations with Europe and the resumption of the technical committees established under the Egyptian-European Partnership Agreement. Another milestone for Egyptian diplomacy in 2015 has been Egypt’s success at promoting the issue of combating terrorism to the top of the international community’s list of priorities. The numerous terrorist incidents witnessed in the region throughout the past period attest to the soundness and accuracy of Egypt’s vision; we have consistently placed utmost importance on fighting terrorism, and not distinguishing between terrorist groups, or terrorism taking place in one country as opposed to another. Egypt also placed utmost priority on fighting extremist and radical ideas throughout the different stages in which they are propagated, from their very formulation, through to their dissemination, and finally to the recruitment of extremist elements. In addition, Egypt has consistently emphasized the need to dry up sources of terrorist financing, increase border control, combat illegal immigration and border infiltration and counter illicit trafficking in arms. I believe that that we have successfully placed all of these issues at the top of the international community’s agenda. Egypt’s election to a non-permanent seat in the UN Security Council, with wide support from the General Assembly, is one of the most important achievements of Egyptian diplomacy in 2015. It reflected the international community’s support for Egypt and its trust in Egypt’s ability to assume its responsibilities in the area of international peace and security as well as to promote African, Arab and third world causes inside the Council. Another accomplishment is Egypt’s recent selection to head three specialized committees in the Security Council, namely the Counter-Terrorism Committee and the UN Sanctions Committees Concerning the Democratic Republic of Congo and Iraq. There is no doubt that this required tremendous diplomatic efforts by Egypt’s embassies overseas, as well as the Foreign Ministry and the Egyptian state as a whole. This ultimately led to Egypt being able to garner the huge support it received in these international fora. How do you perceive Egypt’s ability to maintain the balance between its relations with the United States and Russia, especially in light of an increasingly polarized world? Egypt’s foreign policy is not based on the idea of axes and alliances. It is a balanced policy that is open to all and seeks to benefit from the comparative advantage of each and every party and international partner. It is based on the principle of strategic partnerships with the countries that have special ties with Egypt. The positive and notable development of Egyptian-Russian relations over the past year does not come at the expense of Egypt’s strategic relations with the United States. This has been proven in a multitude of ways, whether through convening the strategic dialogue between Egypt and the US, after being on hold for five years, or through measures taken by the American side to lift previous limitations on military aid to Egypt. Thus, we are talking about a foreign policy methodology based on communication, and an understanding of how Egypt can best achieve its interests through its foreign relations. This is pursued through a holistic approach that maintains the dignity of both Egypt and its citizens while protecting Egypt’s national security. How do you evaluate the strategic dialogue with the US? The strategic dialogue is based on a number of dimensions, some of which relate to bilateral relations in their different aspects, while others relate to regional issues and challenges that require coordination and consultation between different countries. Finally, some dimensions focus on multi-lateral relations within the framework of relevant international organizations. When it comes to the bilateral dimension of the Egypt-US Strategic Dialogue, we can say that there has been progress in the military, economic and development fields. There is also communication between the two sides on matters related to democratic transition and freedoms, which are strongly linked to increasing awareness by the US of the dangers and challenges Egypt currently faces. There is no doubt that reaching this stage was the result of huge efforts on Egypt’s part in its communication with the US administration and different US policy-making circles to clarify the internal situation and challenges. There has also been notable progress in the regional dimension. The past period witnessed intensified communication at the foreign ministers’ level, as well as visits by the US Congress. This all reflects that the US realises that Egypt is a true partner in the region – a partner whose assessments it needs, regarding crises in the region. The US takes into account Egypt’s vision and assessment of the situation in Libya, as Egypt is a neighboring country that is directly involved in the situation there. The US also makes sure to maintain close coordination on the Palestinian issue, due to the communication channels Egypt possesses with different Palestinian parties as well as with Israel. This is not to mention Egypt’s ability to present new ideas, long-term solutions and a serious and realistic vision for the future to activate the peace process. The same applies to the crises in Syria, Iraq and Yemen, especially with regard to having a strategic vision towards Arab national security and how best to consolidate and safeguard it. Egypt addresses these challenges from a long-term and comprehensive perspective, and not from a narrow view that seeks to achieve parochial, short-term interests. Egypt’s perspective is comprehensive and seeks to safeguard the security of the region, its stability and its ability to meet the aspirations of its people during the coming years. With Egypt having taken its first step towards joining the world’s nuclear club, how do you view the Middle East as a region free of nuclear weapons? Also, how do you perceive concerns regarding dangerous material potentially falling into the hands of extremist groups in Syria and Libya? Egypt’s position on nuclear weapons and weapons of mass destruction (WMD’s) in the Middle East, and the threat they pose to Egypt’s national security is clear and unchanging. Egypt has consistently led efforts to establish a nuclear-weapons-free Middle East. This policy was manifested in the Review Conference of the Parties to the Treaty on the Non-Proliferation of Nuclear Weapons (NPT), held in May 2015. During this conference Egypt proposed its vision as to how to implement the 1995 NPT Review Conference Middle East resolution [on establishing a weapons of mass destruction free-zone in the Middle East], so as to prevent the spread of WMD’s in the region. Egypt has also continuously called for the universality of the NPT. This is in addition to its active role in the issue of combating terrorism and confronting the dangers of weapons of mass destruction falling into the irresponsible hands of terrorists, who view the whole of humanity as their enemies. In this realm, the dangers increase exponentially. It is for this reason that we constantly reiterate our position regarding the need to prevent dangerous weapons and materials from reaching terrorists, including through increased border control, as well as the importance of adhering to adequate safety standards in established facilities. All these issues are interrelated. As for Egypt’s peaceful nuclear program, we are talking about a different matter altogether. Egypt seeks a peaceful program for the production of electricity that can be used to power development projects, particularly since nuclear and renewable energy are clean, low cost and produce low pollution. This represents a qualitative change that reflects Egypt’s determination to achieve sustainable development and implement the newest technologies. Egypt is committed to benefiting from the best international experts in this field and is set on carrying out this program at the lowest cost and the highest standards of nuclear safety. Egypt made sure that this was explicitly included in the agreement signed with Russia. What about Iran? How do you see Egypt’s interaction with Iran? Egypt has clearly stated that its assessment of the Iran nuclear deal will depend on the extent to which the deal contributes towards the goal of a nuclear-weapons-free Middle East and the extent to which it can influence Iran’s position towards the region and its countries. If the deal achieves these two goals, then Egypt will appreciate its importance. This matter requires close technical follow up by the International Atomic Energy Agency and the countries signatory to the Iran nuclear deal. It also requires that Arab and Gulf countries follow up on Iran’s policies to determine whether they have witnessed a positive transformation or still remain dubious. In light of Egypt’s chairmanship of the Arab Summit.. what is your vision for inter-Arab relations and how to consolidate regional action, particularly since most problems in the region are a result of inconsistency in Arab policies? One must look at inter-Arab relations realistically. The Arab region is filled with crises and challenges that threaten the very existence of some states. Since current circumstances are exceptional, they must be addressed in a manner that is equally exceptional, rather than the traditional approach to the issue. This was President Sisi’s approach from the outset, since he proposed the initiative of establishing a Joint Arab Force, through to his close engagement with the regional centers of power such as Saudi Arabia and the United Arab Emirates, and his communication with Jordan. There is a strategic vision in place that aims to awaken the region to face up to the grave challenges we face. Egypt’s vision is that, as individual states, we will not be able to overcome these challenges, which include terrorism, state failure, armed conflicts, foreign interventions, designs and interests in the region, as well as humanitarian disasters including the refugee and IDP crisis. Such challenges cannot be confronted by any single state alone; however, we must work on coordinating our policies in order to benefit from each state’s unique capabilities and comparative advantage. This is what Egypt hopes we can achieve and that the region will focus on in the upcoming period. Of course, we expect the Arab League to play an important role in this regard. In light of this, how does Egypt view the Turkish invasion of Iraq? Egypt refuses and condemns outright any foreign intervention in the affairs of Arab states or infringement of their sovereignty. Iraq is a pivotal state in the Middle East; the preservation of its sovereignty is essential. The challenge that we face as Arab States is how to act in solidarity against these interventions, which take place under different pretexts. We are in need of a strong and unified Arab stance, and a vision for the future that can envisage what the region will look like in 10 years. We must set our priorities in moving forward, build on our strengths and address our problems and challenges. This requires a long-term vision and enhanced coordination between Arab countries. The events in Jerusalem are a negative development in the year 2015. How does Egypt believe this matter should be addressed in 2016? In 2015, Egypt’s approach to the Palestinian question has developed substantially. Egypt has adopted a vision that calls for the final settlement of this conflict; we are not prepared to entertain any proposal or idea that does not aim for a final settlement, on the basis of international law and the two-state solution. What is required is to see the end goal and aim for it, within an agreed time-frame. We are beyond wasting time on procedural matters and discussions with no objective. It is no longer acceptable for an entire people to live under occupation in the 21st century. It is also no longer tolerable to accept the daily infringements against a whole nation’s heritage. We are now focused on a few specific points: how to afford protection for the Palestinian people, how to reach a real truce on the ground, how to take specific measures towards confidence building that will launch an actual peace process, leading to a lasting peace with a clear objective in sight. A number of confidence-building steps must be taken, including: first, an end to all settlement activity that is swallowing up Palestinian lands day-in-day-out, in a manner that threatens to leave no land to negotiate on. Secondly, an end to the daily escalation that helps to fuel anger and a thirst for revenge. Finally, there needs to be a serious approach from the United States, supported by other global powers in order to put in place the cornerstones for meaningful and effective negotiations between the Palestinians and the Israelis. There are signs of a breakthrough in negotiations on Syria. The Syrian opposition has met in Riyadh to unify their positions. There are increased talks of the possibility of a Syrian/Syrian dialogue at the beginning of the new year. Howe does Egypt see the chances of a settlement, after years of devastation for the Syrian people? In 2015, the Syrian situation was, indeed, catastrophic. The Syrian crisis was exacerbated in all its aspects, particularly the humanitarian suffering of the Syrian people and Syrian refugees. This was a warning sign for us all that it was no longer possible for the international community to bear this humanitarian crisis any longer. The Egyptian position on this matter has had clear goals and objectives from the start, namely the following: first, the importance of putting an end to the suffering of the Syrian people; second, finding a political, rather than military solution to the crisis; third, counter-terrorism efforts must progress hand in hand with the political settlement; fourth, the importance of preserving the Syrian state and preventing its collapse and finally, the need to make the Geneva I Communiqué the basis of any dialogue between the Syrian parties. Egypt has remained committed to this position from the beginning and has maintained it despite the changing circumstances. Hence Egypt has supported UN envoy de Mistura and has hosted Syrian opposition conferences that ended with the issuing of a national charter and a road map to implement the Geneva Communiqué. Egypt has also taken part in the meetings in Vienna and New York and has supported all anti-terrorism efforts in Syria. We hope to see a real breakthrough in Syria in 2016 that leads to Syria’s transition to a new phase that achieves the aspirations and hopes of the Syrian people to live in peace and prosperity. With respect to confronting terrorism, there are also signs that France is preparing a military strike in Libya. How do you see developments on the Libyan front? The Egyptian position on Libya is a very cautious one as the challenge for Egypt there is huge, given the possibility of a complete collapse of the situation and the spread of terrorism, due to the lack of a central government. For these reasons, from the very start of the crisis in Libya, Egypt has been one of the most affected countries. Egypt is therefore heavily invested in the Libyan case and has, from the start, supported the UN envoy and his role in hosting the dialogue between various Libyan parties. Egypt also participated closely in all rounds of dialogue between Libyan parties, in order to offer support to our Libyan brothers and the UN envoy, and sponsored a number of meetings of Libyan tribes. This is part of an overarching effort that aims to have Libyans overcome their internal differences and rise above their different affiliations; to put the Libyan nation first and foremost. We hope that in the coming days the Libyans can form a national unity government. This would be the starting point to move forward on the correct path. As for the French moves, the growing threat of terrorism in Libya caused by instability there, and the recent horrific acts of terror that have affected everyone, mean that it is no longer possible to confront terrorism with leniency. We will find more and more attention from global powers that want to combat terrorism in Libya, but the most important matter now is the formation of the national unity government. You have just come back from the six-party talks in Khartoum for the Foreign and Irrigation Ministers of Egypt, Ethiopia and the Sudan. The Egyptian people are increasingly worried about the fate of the talks on the GERD and its potential effects on Egypt’s water resources from the Nile. What is your assessment, since you have been a main party in these talks from the very beginning? To begin with, it is important for us to realize the strategic nature of the relationship between Egypt, Sudan and Ethiopia. Any assessment of the challenges these relations face must be based on a complete understanding that the three states have true common interests that they seek to achieve and preserve through cooperation. In Egypt’s quest to achieve these interests, it is keen to avoid any harm to any other party. There is no doubt that there is a legacy of negative Egyptian-Ethiopian relations. Both parties agree that this is based on years of lack of communication and relying on negative perceptions of the other, although the River Nile has, and will continue to, tie the destinies of these two states together. The GERD is among various issues that represent an important challenge to relations between these three states, as it directly affects the interests of all three parties. Ethiopia wants to generate energy from its Blue Nile resources, while Sudan would like to benefit in terms of its agriculture from a regulated water flow as a result of the dam’s construction. Egypt also has legitimate fears regarding the dam’s potential effects on its uses of the Nile waters. For these reasons, the three states agreed to enter into a negotiating mechanism known as the Tripartite Committee, which aims to prepare the studies recommended by the International Panel of Experts, to assess the real effects of the dam on the two downstream States (Egypt and the Sudan). These studies pertain to the potential effects on water resources, the economy and the environment, and include proposals to avoid harm. What I would like to say clearly is that the specific effects of the dam and how to avoid them cannot be apparent unless the required studies are concluded, and their results used as a benchmark to reach a permanent and lasting agreement between the three states on the optimum mechanism for the dam’s filling, operation and reservoir capacity. We also must not forget that the three states, with direct orders from their political leadership, successfully reached an important declaration of principles last March in Khartoum. This agreement is the first legal instrument on cooperation to be concluded by all three states regarding the issue of the Nile waters. The real importance of this is that it is a new and unique practice of cooperation regarding the operation of a dam in one state in coordination with dams in other states, in order to guarantee the utmost benefit to all states involved and to avoid harm to any of them. In other words, there is an interest for all three parties involved to make this experience succeed, as a model for cooperation in an international river as important as the Nile. Such cooperation can lead to mutual benefits and can transform a river into a source of cooperation rather than tension. With regard to the current negotiations, there is no doubt that we are currently at a cross roads. The technical side has been delayed due to the inability to choose a consultancy firm that will undertake the studies. This is because the two firms initially chosen failed to agree on how to work together. This is a matter that has required the three states to sit down once again in order to agree on certain issues and other firms to be used in order to come up with the requested studies. This is not an easy matter as the way in which both the French and Dutch firms were chosen was a complicated and time consuming process, which took into consideration many technical details. Repeating this process would consume much time. Simultaneously, the construction of the dam is proceeding on the ground. It is therefore important to reiterate the provisions of the declaration of principles and the time-frame it put in place, to guarantee that after finalizing the required studies the three states will be able to reach clear rules on operating the dam and filling up its reservoir in a manner that preserves their mutual interests, as well as implementing all the study’s recommendations and conclusions. In conclusion, I would like to affirm that we are in the midst of a very complex and exacting cooperative process and that all those involved must be patient. Egyptian citizens must trust in the capacity of their state and negotiators to protect their water rights. Under no circumstance can any Egyptian official compromise Egypt’s water security. 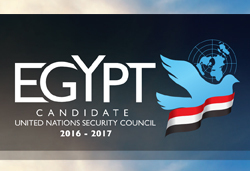 What about Egypt’s Work Agenda in the Security Council for the year 2016? Egypt’s membership of the Security Council marks a new phase whereby Egypt is considered a partner in the maintenance of international peace and security, and not just responsible for protecting its own interests. This means that Egypt has become a partner among 15 states that carry the burden of the preserving peace and security at the international level. National interests cannot be the only force that moves Egypt in the Security Council. Our priorities are definitely Egypt’s interests as well as maintaining peace and security in the Middle East and Africa, and supporting conflict resolution in the Middle East. Egyptian society and public opinion should view Egypt’s role from the perspective of the responsibility placed on it as an international partner entrusted with maintaining international peace and security. There is no doubt that our priorities are Arab and African issues, combating terrorism and the Palestinian cause. Egypt prioritises all these issues, as we will play an important role in developing the Security Council’s approach to them, in light of our role as a state affected by these issues and challenges. There is also big opportunity for us to enhance our relations with other countries in our regions, whose interests we will be representing. There will definitely be opportunities for closer cooperation with our African brothers, especially when it comes to promoting African issues in the Council. The same applies to Arab issues, seeing as we are the only Arab state in the council at the present time. We will carry the responsibility of the situations in Syria, Libya, Iraq and Yemen, as well as combating terrorism. We will talk about all of these issues and will adopt progressive positions in this regard. We will communicate our thoughts and concerns to the members of the Council and the Council will be keen to hear our assessment, seeing that we are part of the region and we know how to take on these challenges and how to resolve them. This issue of Turkish influence on Gaza producing support for the terroristic and fascist tendencies of Hamas is why the unification of the Palisraeli territory is so crucial. Once this hybrid State is formed the Arab population can be split into Republicans who favor security and stability that side with Egypt and the Democrats who favor liberal freedoms and side with Turkey. Hamas no longer has a role. The use of violence as a political tool becomes obsolete. The Jews then also split and their corresponding ideologies align with the Arab groups to form political blocks that are no longer delineated by religious or ethnic divisions. The train of Democracy then has two distinct groups, the coal stoking liberal for whom the train never goes fast enough and the Republican brakeman who steadfastly slows the train to avert derailing on the pending twists and turns of a modernizing electorate as it winds through a myriad of social issues.